Leak is passionate about beautiful sounds and well-crafted events, events full of effort, detail and memorable production. Although his activities are eclectic and varied, he considers them all to be his own kind of composing. Random Audio Sample: Improvisation trio (trios: trombone, drum kit, piano) by Graeme Leak, from the CD La Trobe University Music Department CD archive, volume 7. 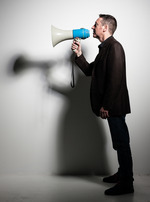 Graeme Leak is a freelance composer, performer and project-maker. Trained as a contemporary percussionist in Sydney and New York, he has integrated his other interests, in fields such as instrument making, audio technology and visual design into a unique hybrid practice. Leak composed and performed his first piece Just Testing in 1978 and has since written over 50 publicly presented works including And Now for the News (percussion and tape 1983), Finale for World Drumming Spectacular (Massed Percussion Forces, Commonwealth Games 2006), and Everything in Front of Me (SSA children's choir and percussion quartet 2010). Leak works with a range of skills from total beginner to professional, often side-by-side. He endeavours to facilitate enjoyment and participation in art. He was a founding member of both Flederman and Synergy, ensembles dedicated to championing new works by Australian composers. As Head of Percussion at Sydney Conservatorium from 1986 to 1990 he facilitated practical crossover between the schools of percussion and composition, which meant teaching improvisation and rhythm skills to composers while encouraging his percussion students to write their own recital pieces. Leak was Head of Performance Studies (and in 1999 Head of Department) at La Trobe University Music Department, renowned for its profound approach to music and performance. Leak has toured and performed/conducted his original material in Australia, the US, Europe and Japan. He has composed large-scale works for most major Australian festivals and built a Musical Fence, which is now a tourist attraction, in Winton, Outback Queensland. He co-founded the Spaghetti Western Orchestra (SWO), steering it from its St Kilda café beginnings to regular touring in the UK, Europe, the United States and Asia. SWO played a BBC Proms concert at the Royal Albert Hall in 2011. Leak is also a workshop leader in group-devised musical performance, music skills and instrument making. He has written a book, Performance Making, a manual for music workshops and self-publishes his scores via his website www.graemeleak.com. He is currently based in the UK.